Typically european, Fondue was born in Switzerland with melted cheese... Nowadays the recipes are countless and so is the fondue preparation. Sweet or salty, a fondue is always a great gathering moment. Its majestic look, with a classic and elegant design, will be the centre of all attentions. Specifically designed for slaty dishes, widen up your imagination and prepare a rocking fondue!!! Enjoy!! Dip, wait, lift and enjoy.... a quite intense physical exercise!!! But very tasty. 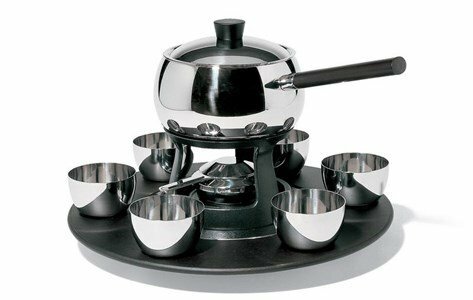 The polished stainless steel Fondue Mami has a painted black wooden handle, and the base, diffusing plate, burner and plate are made of 18/10 stainless stel. 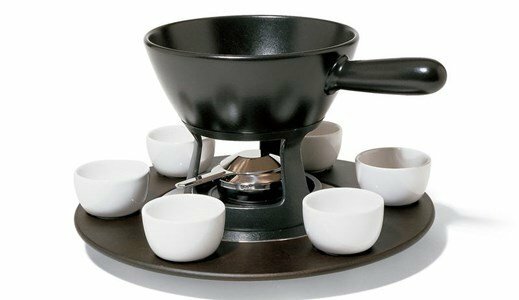 The black fondue Mami is made of porcelain, and the base is made of cast iron, the diffusing plate is made of aluminum and the burner and plate are made of 18/10 stainless steel.